projects you do want the little guys. There are a few ways to get them at a relatively decent price. There are small "starter sets"that typically come with four minifigures for about $10.00. They usually also have a small vehicle or building with them, and the ones out right now include Police, Fire, Construction, and Space sets. (I was wondering about the wisdom of them putting out a set called "Fire Starter Set," but hey. LEGO does no wrong.) That's more minifigures than you get in many LEGO sets--even the largest sets only have about six characters in them these days. So going small in this case may be better. The other option, and one I recommend to classroom teachers, is to buy the sets offered through LEGO Education. They've got two different sets: Fairytale and Historic Minifigures and Community Minifigures. Each comes with 22 characters; "Fairytale and Historic" includes kings and queens and knights and soldiers and bandits and pirates and witches and mermaids and uh, a snake charmer. One of these things is really really not like the others. "Community" means the people in your neighborhood, so police, firefighters, EMTs, mechanics, postal workers...those kinda people. Both sets have a lot of pieces and accessories to make those worlds come to life, so besides the minifigures you're getting tiny castles and swords and treasure chests and skateboards and pizzas and gold mines. If you want an instant classroom set of minifigures, buy one of each of those, and you're done. 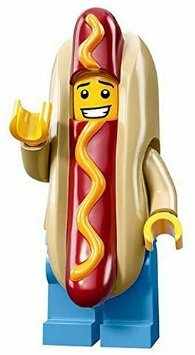 Sadly, Hot Dog Suit Guy seen above is *not* one of the LEGO Education Minifigures. Ah, I love him. Beware the LEGO knockoffs that you find on Amazon or eBay; the ones I see most often are sets offering 20 LEGO minifigures for six bucks. Seems too good to be true? Well, it is. It bothers me enough that they're violating LEGO's proprietary rights by making them in China for pennies and then selling them here...but having bought a set to see if they're the same as LEGO...they're not. Cheap plastic, legs that fall off, arms that don't move, heads that are loose and get lost, with hairpieces/hats that don't fit. So...if you're tempted, because you've got a tight budget and think "hey, this will make all my students happy!" ...they won't. They'll be frustrated at the minifigures breaking and ruining whatever Big Plans the kids had. So don't bother.